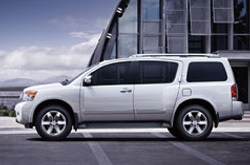 Thanks for choosing Texas Nissan as your resource for 2013 Nissan Armada reviews. Stop worring about your next Nissan purchase; look to the premier Armada dealership in Dallas - Fort Worth for well researched reviews authored by automotive enthusiasts. 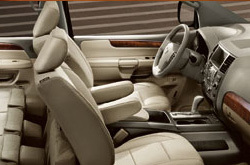 To make versed decisions when it comes to your next Nissan Armada purchase, don't guess! Each paragraph is bundled with facts and Armada features in way that's easy to understand. Good luck on your Armada search! Comparing the 2013 Nissan Armada head-to-head with against vehicles like the 2013 Buick Enclave, Ford Expedition and the Toyota Sequoia, and you will spot that the 2013 Armada outperforms the competition in many areas. Look over our bullets to see why! No national car repair sites in Dallas - Fort Worth, Texas offer Texas Nissan's wonderful combination of certified Nissan Armada service techs, full year warranties on all repairs and Nissan OEM parts. Keep your Armada running well; have it serviced by Texas Nissan's knowledgeable car repair technicians. Whether you're searching for cheap engine repair or less time consuming work like tire rotation and replacement or snappy oil changes, we'll take care of it! And these things are barely a small part of the repairs we do. Above this, Texas Nissan offers one-on-one customer service and thrifty prices. Click the upcoming link to be taken to to Texas Nissan's service coupons.